This is the sixth post in a series on the LEED green building rating system. 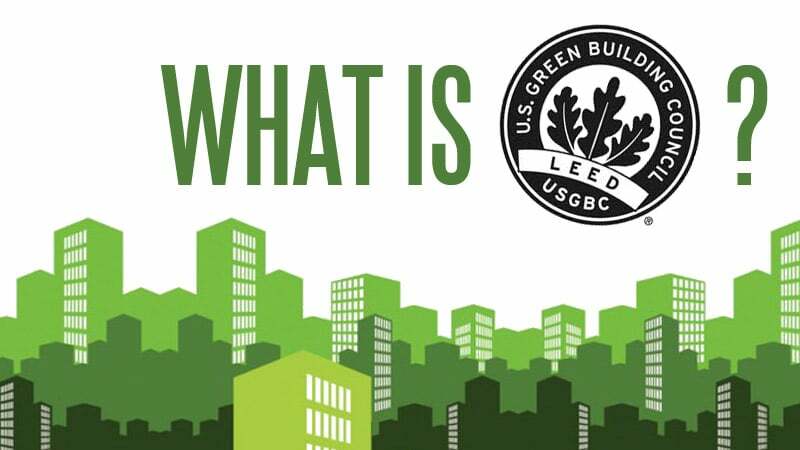 The first post provided an Introduction to LEED, the second looked at the Sustainable Sites credit category, the third at the Location and Transportation credits, the fourth at Water Efficiency, and the fifth at the Energy and Atmosphere credits. What materials are used, where they come from, how they are made, and how they are disposed of are instrumental in determining how green a project is. Using more green materials, including renewable materials, recycled materials, and natural materials, is good for the building occupants and the environment. LEED v4 shifts the focus a bit, providing credits for using materials that have published life cycle assessments and environmental product declarations. This is a required measure and must be completed to qualify for LEED certification. Projects must provide space to allow for storage and collection of recyclables. Materials collected must at least include paper, cardboard, glass, plastic, and metals. The project must also make arrangements for the storage and collection of two of the following: batteries, mercury-containing lamps, and electronic waste. This is a required measure and must be completed to qualify for LEED certification. The project must develop a waste management plan for use during demolition and construction, and report on actual diversion rates for all debris leaving the site. At least five materials must be targeted for recycling or reuse. This credit is worth 2-5 points. There are four options to achieve points: (1) Reuse a building listed on a local or national historical register, following requirements of the appropriate program for rehabilitation – 5 points; (2) Renovate an abandoned or blighted building, maintaining at least 50% of the existing structure and interior elements – 5 points; (3) Re-use or salvage, from on the project site or off-project, building materials to equal 25-75% of the surface area of the project – 25% for 2 points, 50% for 3 points, 75% for 4 points; (4) Provide a life cycle assessment of the structure and enclosure, showing a minimum of 10% reduction in at least three of six impact categories, including global warming potential, ozone depletion, and depletion of non-renewable energy sources – 3 points. This credit is worth 1-2 points. Use at least 20 permanently installed building materials, from at least 5 different manufacturers, that have had an environmental product declaration published – 1 point. Use products certified as providing a reduction in environmental impact for at least 50% of the permanently installed materials. Products sourced within 100 miles of the project site count at 200% of their cost – 1 point. This credit is worth 1-2 points. Use at least 20 permanently installed building materials, from at least 5 different manufacturers, that have publicly released a report showing their extraction locations, methods, and a commitment to sustainable extraction practices – 1 point. Use materials, for at least 25% of the total material cost, that are: bio-based products, FSC certified lumber, salvaged or reused, have recycled content, or have a producer responsibility program. Products sourced within 100 miles of the project site count at 200% of their cost – 1 point. This credit is worth 1-2 points. Use at least 20 permanently installed building materials, from at least 5 different manufacturers, that have published reports showing the chemical content of the material. The reports must be in the form of a manufacturer’s inventory, health product declaration, or Cradle 2 Cradle certification – 1 point. Use materials that have published reports through one of the following programs, for at least 25% of the cost of the permanently installed materials: GreenScreen v1.2 Benchmark, Cradle 2 Cradle certified, or REACH Optimization – 1 point. Use materials that have published reports documenting their safety and health practices throughout the supply chain, for at least 25% of the cost of the permanently installed materials – 1 point. This credit is worth 1-2 points. Using the waste management plan developed in the prerequisite, points are awarded for meeting targets for the amount of material diverted from the landfill and that is recycled or reused. 1 point is awarded for diverting 50% of the waste in at least three waste streams (types). 2 points are awarded for diverting 75% of the waste in at least four waste streams. Or a project can not create more than 2.5 pounds of construction waste per square foot of the building’s floor area for 2 points. Next, we will look at the Indoor Environmental Quality category.